Brrr! It’s that time of year again! In January, winter can often seem endless, and the temptation to curl up under a blanket and forget the world can be nearly overwhelming. Unfortunately, not only do the demands of life and work conspire to get us out of bed when we’d rather hide away, midwinter is often ground-zero for all kinds of nasty bugs such as cold and flu, which can make the simplest daily activities a misery. Pine needle essential oil to the rescue! This invigorating, uplifting oil distilled from the needle-shaped leaves of the pine tree is perfect for easing the winter doldrums, inspiring focused energy, and fighting infection. With a smell like fresh pine needles, pine needle oil is also perfect for diffusion, adding a woodsy, refreshing fragrance to any living area! The pine tree (Abies sibirica) is a coniferous evergreen native to Russia, Siberia, Mongolia and Turkestan, although other members of the Abies genus are scattered all over Europe and North America. Pines prefer forest environments with cold, moist soil and are usually found on mountainsides and in river basins, where they grow in thick groves. With its dense green foliage and conical shape, the pine tree is the model for the classic Christmas tree and can grow up to 30-35 meters (98-115 feet) in height. Pine trees are extremely frost tolerant, able to remain hardy and viable at temperatures as low as -50 degrees Celsius (-58 Fahrenheit) ! Despite their ubiquity, pine trees are not a common source of lumber because their wood tends to be of the softer whitish variety that is unsuitable for building. 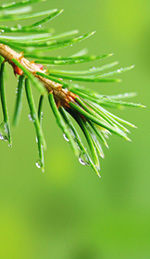 While pine trees have some use as a source of soft wood for making paper and packing crates, their main commercial use is in aromatherapy and perfumery : the balsamic, dry-woody scent of pine needle essential oil can provide a sharp middle note to balance more floral fragrances in soaps, cleansers and personal fragrances. Because it is high in phenols, a class of disinfectant chemicals, pine needle oil is also a main ingredient in the well-known household cleanser Pine-Sol . Yet many centuries before Pine-Sol came onto the market, Native Americans were placing pine boughs in their homes to repel lice, bedbugs and other pests. For generations, pine boughs have also been burned as a purifying incense in Native American sweat lodge ceremonies. Clearly, the pine tree has had a long history as a cleanser and freshener! Like fir needle oil, the essential oil of the pine tree has detoxifying benefits for the whole body when it is absorbed through inhalation, massage, steaming, or in a warm bath. In aromatherapy, pine needle essential oil is primarily used as an analgesic in cases of rheumatism, arthritis, sciatica, and sore muscles ; as a respiratory decongestant for colds and flu, sinusitis, bronchitis, and chest cough ; and to rejuvenate the body and restore mental and emotional balance, especially during the winter months. With its anti-viral and anti-bacterial properties, pine needle essential oil is an excellent complementary treatment for upper respiratory infections , clearing congestion while rooting out infections at their source. Although pine needle essential oil is generally non-sensitizing and non-irritating, it may be irritating to sensitive skin and should always be used in dilution for topical applications. Try adding pine needle essential oil to a facial toner or lotion and let its astringent effects tighten and tone your skin, or add it to a carrier oil as part of an essential oil blend. Though pine needle oil blends well with many essential oils, our favorite way to use it is in an immune-stimulating, invigorating blend of other piney oils such as cypress, cedarwood, fir, and rosemary. To really give your constitution a lift during these short days, try adding a few camphoraceous oils to this mix, such as eucalyptus, niaouli, and tea tree oils, all of which have their own expectorant and anti-microbial properties . Synergized with pine needle oil, this blend will give you all the energy you need to make the most of the daylight hours! 1. “Abies sibirica“. Wikipedia. Accessed May 2nd, 2014. http://en.wikipedia.org/wiki/Abies_sibirica. 2. Stewart, Susan and Vicki Ambrosio. A Beginner’s Reference Guide to Aromatherapy and Herbs. Lulu.com: 2011. 3. Keville, Kathy. “Aromatherapy: Fir”. HowStuffWorks. Accessed May 2nd, 2014. http://health.howstuffworks.com/wellness/natural-medicine/aromatherapy/aromatherapy-fir.htm. 4. Inouye, Shigeharu, Toshio Takezawa, and Hideyo Yamaguchi. January 22nd, 2001. “Antibacterial activity of essential oils and their major constituents against respiratory tract pathogens by gaseous contact.” Journal of Antimicrobial Chemotherapy 47 (5): 565-73. This entry was posted in Aromatherapy, Essential Oils and tagged essential oil for memory on January 15, 2014 by Keith Cleversley.